In 1996, he was one of only twelve artists selected by the United States Olympic Committee to represent the 100th Anniversary of the Olympics held in Atlanta. A painter of sports figures, Stephen Holland, as a young painter, could not afford to hire live models, so the images he found in boxing magazines became his subjects. There he saw the male form in all its power and glory, expressed as contemporary gladiators. The magazine articles conveyed to him the determination and hard work any athlete must have to be a winner. Holland found this an inspiration to himself as an artist. He put as much discipline, devotion and determination into his own work to express what both he and the athlete experience. None of this dedication came easy for Holland. As a child he was handicapped and had to watch his family and friends play sports. The steel brace he wore on his leg prevented him from attending neighborhood schools. But handicaps often heighten one’s other sensitivities, and this proved true for Stephen Holland whose talents developed elsewhere. His gift for drawing grew as he sat and sketched his friends. Though his mother used to say he began drawing as soon as he could hold a pencil, Holland's abilities actually blossomed while attending a special high school which devoted half of each day to art studies. He later attended the Art Students League, the School of Visual Arts and Pratt Institute, all in New York City. 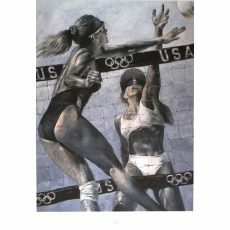 Holland's talent and contributions to art and sports received national recognition in 1993, when the American Sport Art Museum awarded him the honor of Sports Artist of the Year. He is also honored as the Official Artist of the Los Angeles Kings. 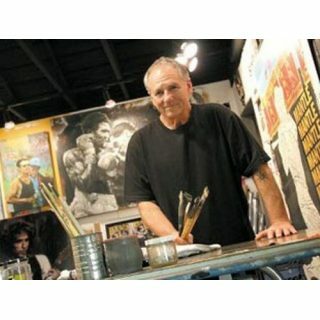 His work is found in the collections of celebrities, athletes, and private collectors around the globe.